Phantasmagoria is a game with an interesting mix of point and click adventure, horror and interactive movie. The game was released back in 1995 and its success led to a controversial sequel that was so horrifying it was banned in many countries. The game was one of many interactive movie style games being made during the time and uses real actors. At the time of its release the game took up a massive 7 discs and is still a fairly large game even by today’s standards coming in at just under 2GB. The story of Phantasmagoria revolves around a writer (Adrienne) and her photographer husband (Donald) who have recently purchased a large mansion in a remote area. The mansion was previously owned by a famous magician known as Zoltan Carnovasch. Adrienne hopes that the new surroundings will give her the inspiration she needs for her next book while Donald is excited about the remote location and the space to setup his own darkroom for his photography. Soon after moving in to their new mansion crazy events start to take place around them. It quickly becomes apparent that Zoltan was no ordinary magician and that he enjoyed participating in dark magical rituals which eventually led to him being consumed by a demon. From here the player explores the mansion and learns more about how to dispose of the demon while also uncovering the truth about the last years of Zoltan Carnovasch. 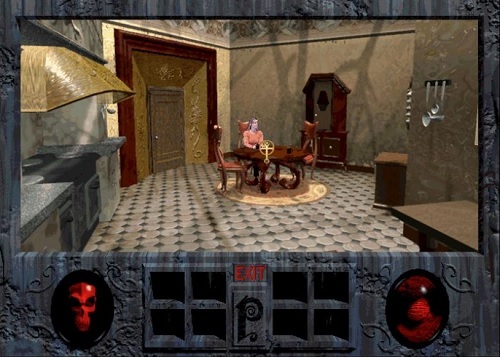 Gameplay is predominately a point and click adventure with players moving through the mansion while interacting with the game world. Puzzles are also around every corner which the player will have to solve in order to discover the truth. For a game released in 1995 the game has a surprisingly eerie feel that is maintained during the entire game. The interactive movie is also something most gamers would not have experienced before and there is no better game than Phantasmagoria to have your first experience with this once popular genre. A point and click horror adventure. Uses interactive movies for gameplay. Dark story that isn’t for the faint hearted. Plenty of puzzles to solve.